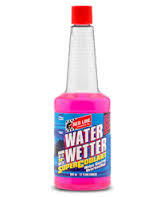 This product claims to double the wetting ability of water, improve heat transfer, reduce cylinder head temperature, reduce rust, corrosion and electrolysis. It also claims to clean and lubricate water pump seals. Can be used with all antifreeze/coolants. This product claims to improve the ability of coolant to wet heat transfer surfaces by 50%. This provides significantly better coolant contact in the cylinder head and can reduce coolant and head temperature by as much as 20 degrees F. Can be used with 100% water in racing but does not protect magnesium or alter freezing point. In our experience a well maintained, cherished, well looked after vehicle may not need such a product.